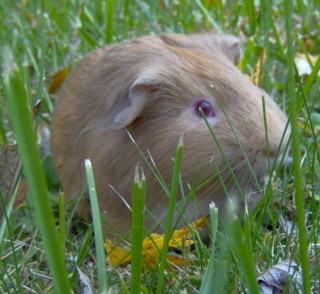 Sadly, Butterfinger the guinea pig died this past Monday. He met his untimely end at the hands of an undisciplined dog. He will be missed. Brrrr, it's cold in this new place too. Though during the day I get moved down to the "laundry" area where it is warmer. I should plot my escape. Last night I had the clever plan to bundle up in my blanket, but I accidentally touched it to my water bottle. Flooding disaster! I squeaked up a fuss, manipulating them into fixing things. Currently eating: Potatoes and other strange vegetables! Brrrr, after a long time without traveling, the humans swept me into my one-cage configuration and shoved me in a cold traveling machine and then it was bumpy ride for 7 hours, with the small one in the back fussing intermittently. It is cold here, maybe if I start making ruttling noises the humans will pay attention to me. They're all worked up about white powder falling from the sky. Currently eating: More carrots. You'd think more vegetables would be cooking, with the holidays and all. Hooray! The humans have left on a long trip, leaving me behind! Including the small noisy one! Finally, some peace and quiet. I partied too much and was running low on food, luckily one of the extraneous humans (that's one of the noisy bunch that show up every Wednesday) stopped by and re-upped my supply. Currently eating: Alfalfa pellets. Boring, but worth it for the quiet! The accursed small human is trying to brush my hair! Luckily I can retreat into my pipe. Currently eating: The small human's book. I'll show her to throw things into my cage! The small human has become mobile! 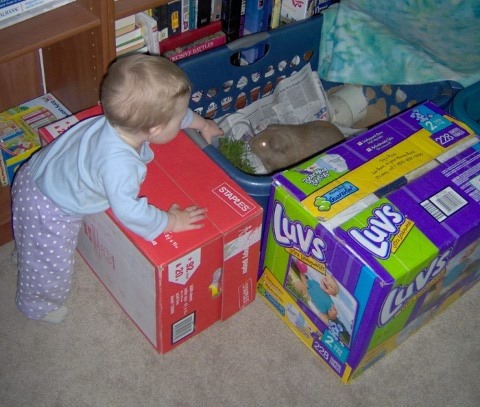 The other humans have built me an impressive set of defenses, but the small one can now reach over them! She persists in throwing random objects into my cage, as well as looming above and jumping and yelling incoherently. I'll show her, I will not be frightened! Currently eating: whatever the small human throws into my cage. Finally, it is warm enough to go outside! 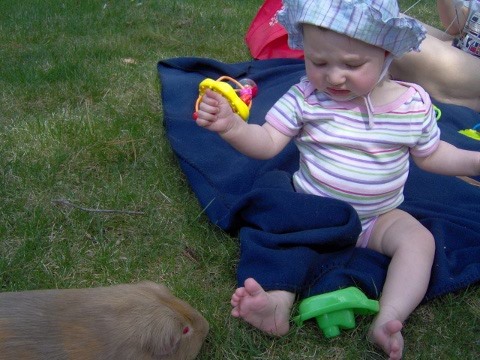 Though the small human keeps trying to poke me. But she got yelled at! Revenge is mine! Currently eating: grass! There's nothing like fresh grass. 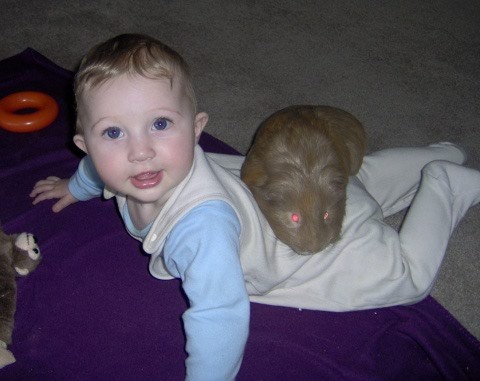 Here's a picture of me keeping the small human in check. Currently eating: alfalfa. Not grass, but an OK substitute. The new human is alltogether too happy to see me. Currently eating: carrots. All I ever get is carrots! The one human had been getting larger, but I was too polite to say anything. Then they left and a new human was hear cleaning all the time! Then the original humans came back, with a tiny little human barely bigger than me. I'm sure this must mean something, I am not sure what. I guess as long as food continues to appear in my food bowl it can't be all bad. The new human gets to sleep in a laundry basket too. Obviously I am still more important, as I have two and the small human only gets one. Currently eating: fresh alfalfa. I convinced the temporary human that it's all I will eat! Again the humans took me away in their infernal traveling machine! I am so glad to be back. They took me down to Maryland where there was naught but noisy amusement machines below, and lots and lots of excess humans nearby. It was hot, and briefly I was even left all alone in a garage! 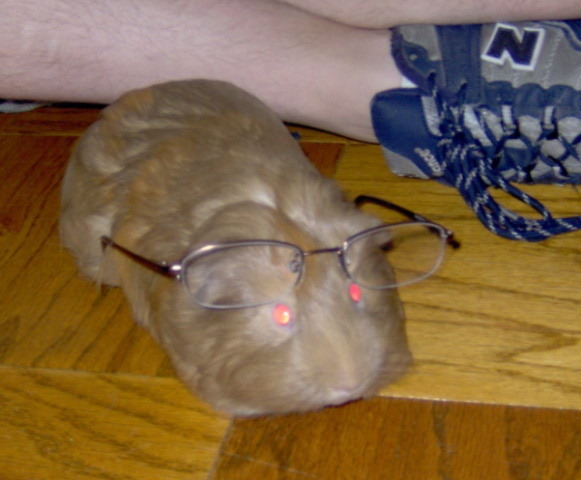 For some reason the one human's bother kept trying to fit me with corrective eyewear. 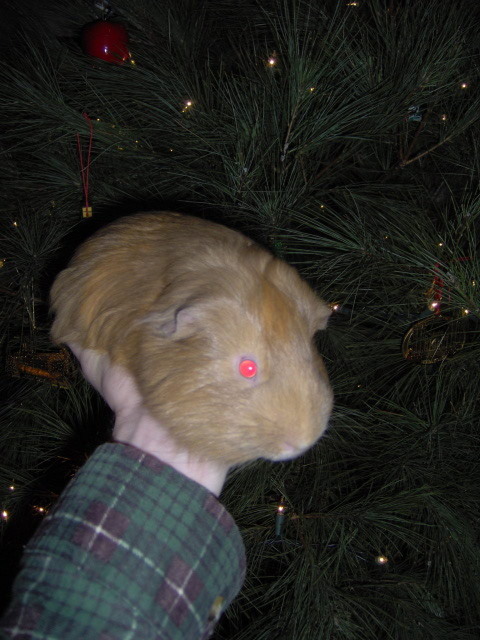 It was a nice thought, but guinea pig eyes are on the sides of our heads, so inferior human glasses will not work! After months of quiet, the humans unstacked my spacious double-wide cage and shoved me in their noisy traveling device and dragged me on a horrible 7-hour journey interrupted by a massive thunder/hail storm. :( I was exiled upstairs and had to always be on the lookout for the large barking creature. Thankfully I am back now, even though it means I had to endure another 7 hours of travel. 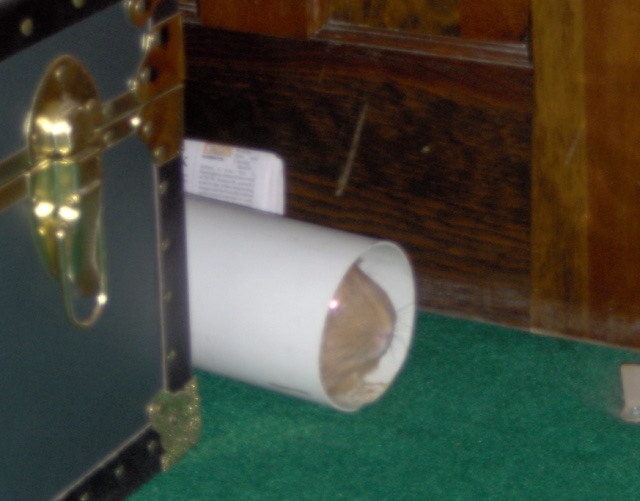 Even though my cage was unstacked, I still managed to hide in my connector pipe. No one can get me when I hide there! Currently eating: A cherry. Now to drool bright red stains of cherry juice everywhere I go. Currently eating: Strawberry tops. 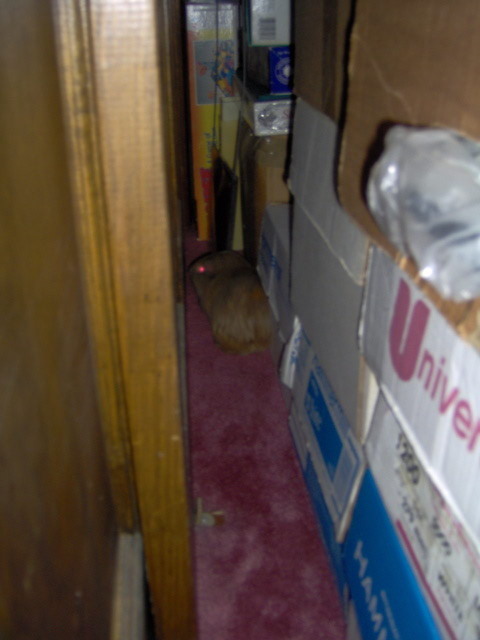 I heard them opening a dresser drawer, but no timothy hay was forthcoming. Annoying. The humans had guests over and watched a noisy movie. I hate when they listen to noisy things. Luckily the "doorway" to the outside was a bit loose, since I've been sneakily taking apart the duct tape that holds in on. So I retreated to the safety of my blanket. Later, when the humans wanted to show me off, I showed them! 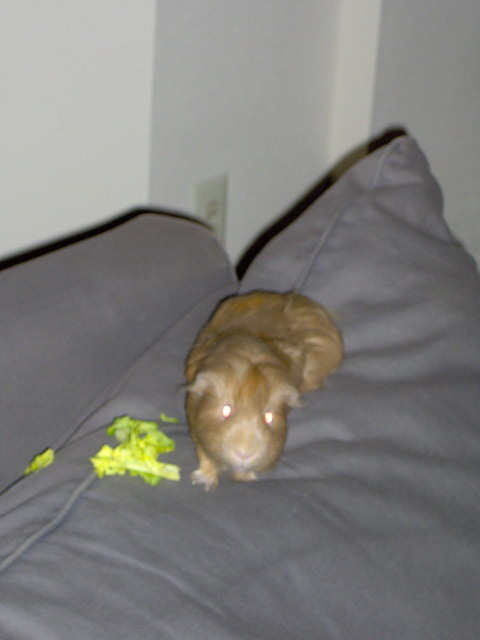 I made a break for the couch, startling all involved. Victory! Currently eating: All they gave me was celery. Humph. I'm going to just squeak for an hour in disgust, then I'll maybe eat it. I had sneakily eaten through much of the transport tube between my cages, but the visitors brought a new tube, made of something inedible called PVC! Foiled! Here you can see my progress on the old tube. 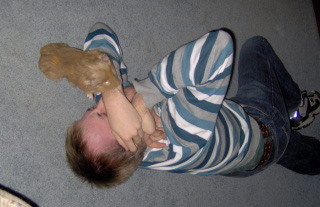 I've found if I hide in the tube I cannot be easily picked up, nor do I have to appear in annoying photographs. Currently eating: The dry dust left with alfalfa pellets reach the end of the bag. Is it asking too much for them to open the new bag yet? I think not. I'm still going to demand that I can run around every night, and never let myself be caught when it is bed time. Plus, I'm going to panic and run to the safety of my tube whenever someone makes even the slightest movement. This will show them! Currently eating: nothing! 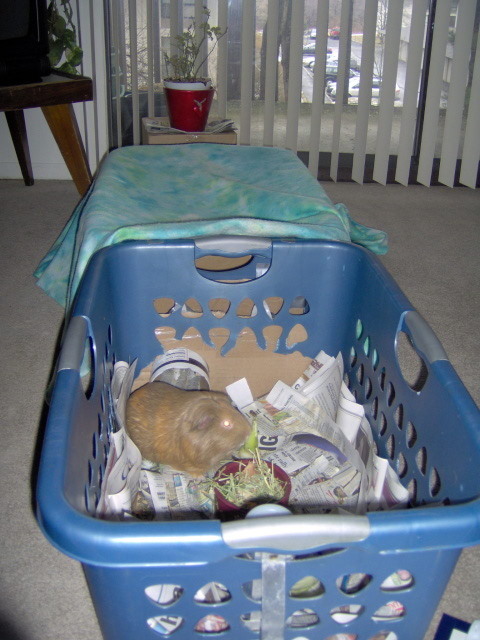 I am going to ignore the dry-food, timothy hay, carrot peels, lettuce, parsnip peel, apple core, and celery stalk in my cage. Instead I am going to run around squeaking anytime anyone even thinks about rustling a plastic bag. It is so cold in here! The humans let it get down to 60°F at night, which makes me sad. I had to drag my food bowl into my box so that I could eat without getting a chill! Currently eating: *not* the celery they just gave me, because it's out in the cold part of my cage not in my box. I was just getting used to living with the female humans, and suddenly I am wrenched back to living with the original humans. This upsets me so much that I'm going to squeak in an annoyed fashion for the next week solid. That will show them. Currently eating: lots of food, but I'm not going to give them the satisfaction of sounding happy. The humans are heading to Scandanavia. I was hoping to tag along, and maybe make my escape. But no, they dropped me off along the way with some undergraduate female humans who I've never met before. 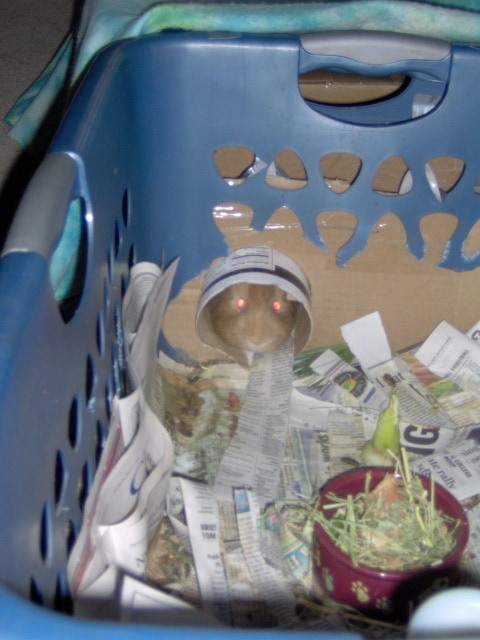 Maybe if I make my cage extra-smelly they'll throw it out, and I can escape. Or maybe they'll be foolish enough to let me near their dishwasher. 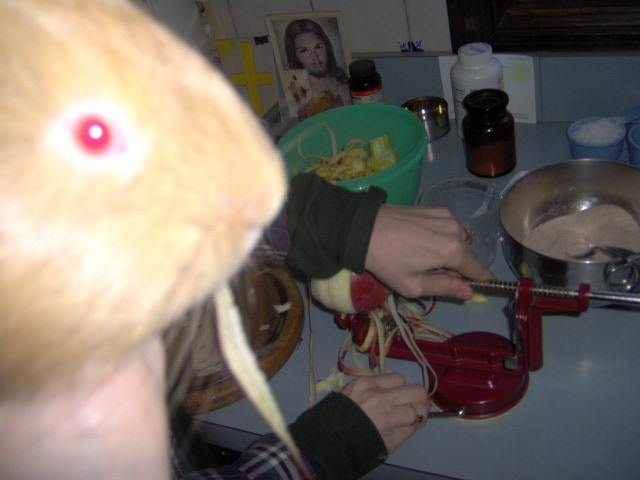 Little do the humans know, that part of the guinea pig conspiracy is to include a weapons cache and escape-pod in every dishwasher manufactured since 1978. Currently eating: Not eating, mainly plotting. Thankfully we are back in Ithaca again, despite the treacherous weather on the way back. If I'm never in an automobile again it will be too soon. Currently eating: *not* eating anything for the time being. The humans are going to Pennsylvania without me! Now's my chance! Maybe if I sabotage the electrical system on their vehicle they'll stay away long enough for me to make an escape. Currently eating: *not* dry alfalfa, because I ate it all last night. Curses! 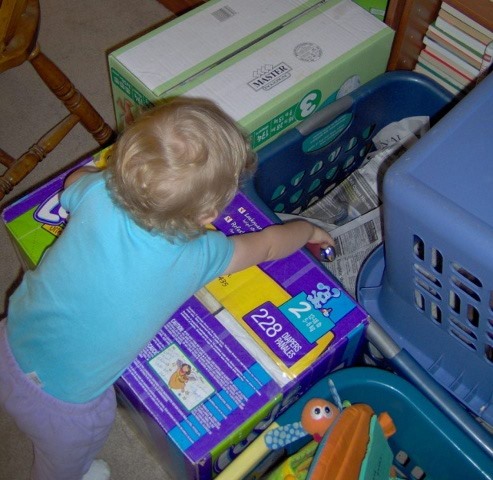 They found a taller box! 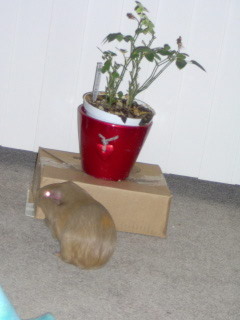 The humans are trying to thwart my rose-eating habits! They placed the plant on a box. Unfortunately for them I've been monitoring them, and I've learned a clever trick they use all the time: standing on their hind legs. Foolish humans. Currently eating: *not* pieces of potato. I don't want to be alarmist, but the temperatures keep getting colder and colder, and the darkness comes earlier each night. I've been alive for 6 months now, and I think I know how things work in this world. According to my predictions soon it will be entirely dark all the time, with temperatures approaching absolute zero! I try to alert the humans to this fact, but they don't understand. Maybe I can use this to my advantage. Currently eating: celery. It's not as bad as I thought it was. There is some strange white powder on the ground outside today. 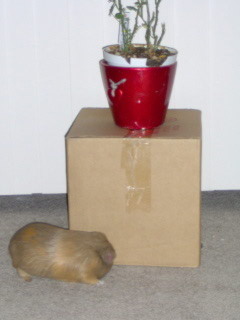 I squeaked demanding to be taken out to see what it is, but the humans refused. Grrr. And I have to huddle in my blanket because it is only 64° in here. The ignominy! Despite the humans' best effort, I will successfully eat the rose bush! They can't keep an eye on it forever! Currently eating: "fallen" rose leaves. Finally, out and away from that infernal traveling contraption! I hate traveling so much. I was stuck with the humans for their "Thanksgiving" holiday. I wasn't thankful! The first trip was to Maryland, where there were loud and noisy electro-mechanical amusement machines. 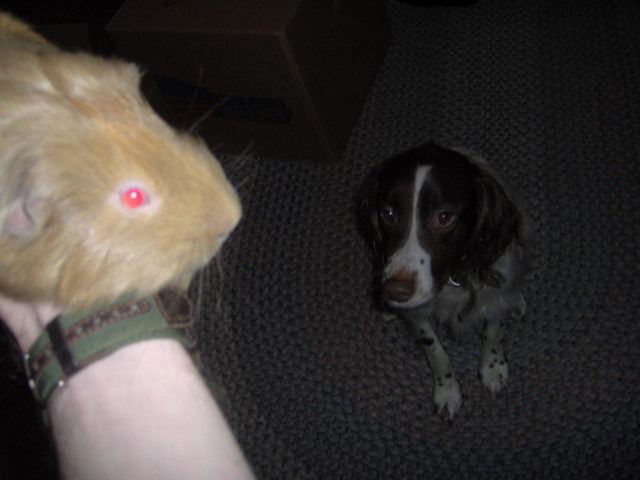 The human's brother treated me without my due respect, and I was rarely allowed to roam free! When I finally thought we were done, then we traveled more, south to Virginia Tech. There I was subject to nicer, yet still alien siblings. And there was this large "dog" creature that did nothing but stare at me, which was definitely unnerving. It is good to be back to the Carrot Lakes region, where I can resist with more confidence. Currently eating: Not the pineapple the humans gave me. Watch this, I'm going to run out of my cage and squeak my head off, for no reason, just to confuse the humans. Haha aren't I clever. Currently eating: No time for eating! I'm squeaking! 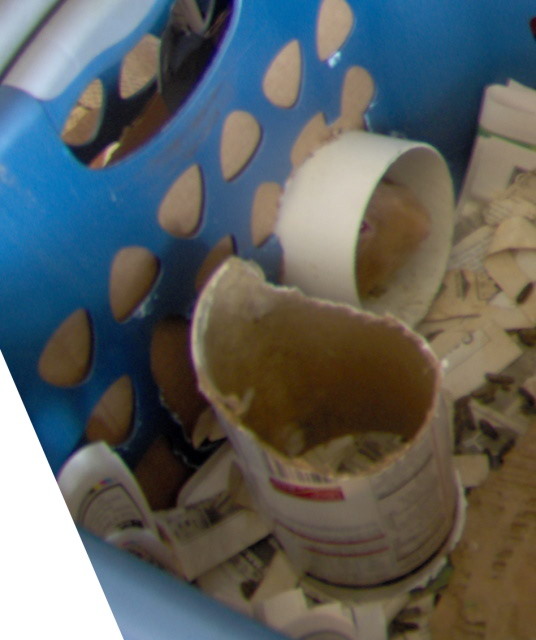 The human threw away my cardboard redoubt! It has been in my possession since they first obtained me! 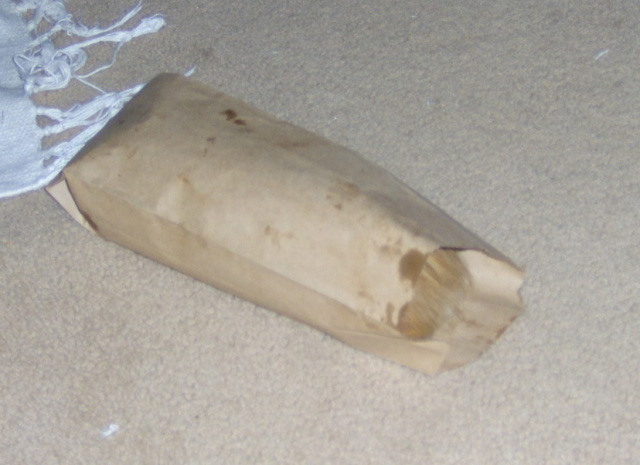 True, it was falling apart and smelly, but I had many important documents stored there. Vengeance! Currently eating: Not my box :(. 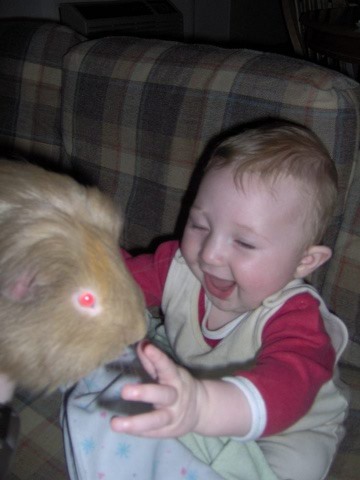 *SNEEZE* Yes, guinea pigs sneeze too. Stupid over-protective humans, they worry too much. Currently eating: whatever I just found on the floor. I was forced into a most horrible noisy traveling device, and dragged south to some place called "Philadelphia". I did not enjoy myself. 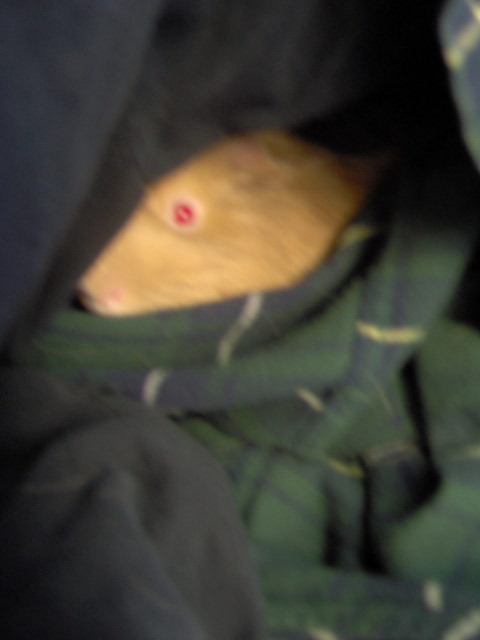 I was only let out of my cage once, and the other humans there laughed as I ran reconnaissance missions. I will have to take measures to make sure something like this does not happen again. 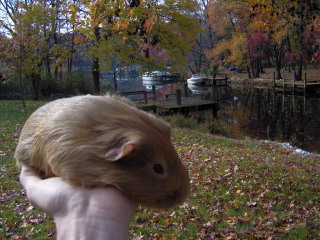 Sometimes at night, I stand in front of the screen door and give the traditional Guinea Pig Freedom Squeak. I hope some day to hear an answer. The humans find this sad, but I find it inspirational. The humans brought home these round objects called "Apples". For once, I approve. 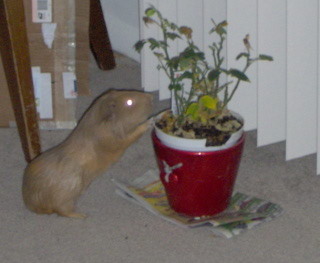 The humans have these delicious house plants scattered throughout my domain. Much more delicious than those "vegetables" they try to feed me. Yet they chase me away when I try to eat them, claiming that some of them are poisonous. Right. Why have plants if you can't eat them? I know the humans keep the alfalfa in the bureau in the closet. For some reason they think they can open that closet door without me hearing. How deaf do they think I am? SQUEAK SQUEAK. Especially if they rustle plastic, which from what I can tell is where all good food comes from. SQUEAK. The human has been holding me on top of the sofa. But I've found out that the jump is not too perilous! He can't hold on to me, I will always escape! To further annoy the humans I decided to chew through the "ethernet cable" that runs under the bed. That will show them! I bet they don't have another 50 foot cable on hand either. Currently eating: Not kohlrabi. Really. I've built an elaborate series of routes in the bedroom, and have found a good variety of objects to chew on. That this seems to upset the humans only makes me determined to keep up my work. I've also found out that I can get under the sofa! That's something Agent Susie never found in all her time here. Unfortunately when I've evaded the human for long enough he somehow manages to overturn the furniture! Unfair! I've decided the humans must be stopped. 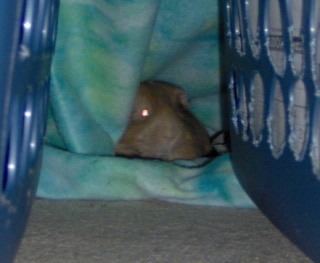 I have built a fort underneath the recliner and have explored both the computer room and the bed room for good hiding places. Currently eating: Not celery. Yuck. Hello! 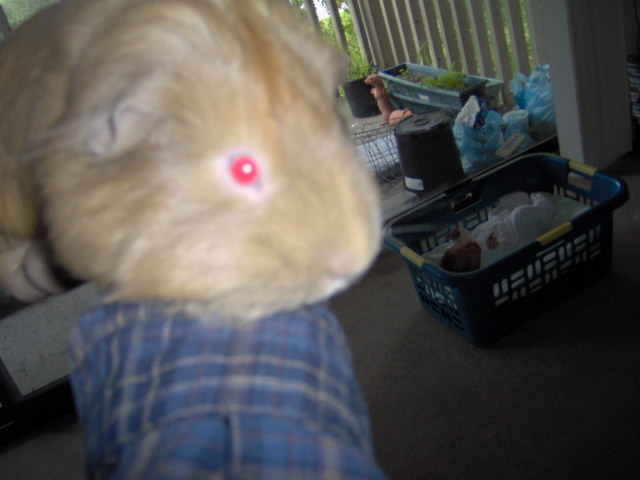 I am special-agent Butterfinger of the Guinea Pig Expeditionary force. I've been sent to replace Stealth Susie who has moved on in her career. 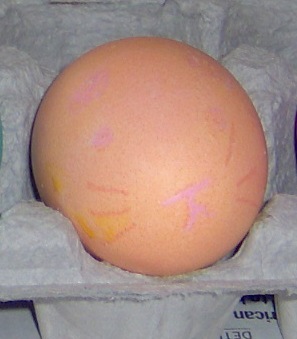 I just now found out I was named because my coloring looks like the inside of a human confectionery treat. Insulting. I don't trust these humans. I'm turning up my nose at this "carrot" that they gave me. The pet store clerk explicitly said not to feed me produce until I am 6 months old. Currently eating: Not any of those carrots.